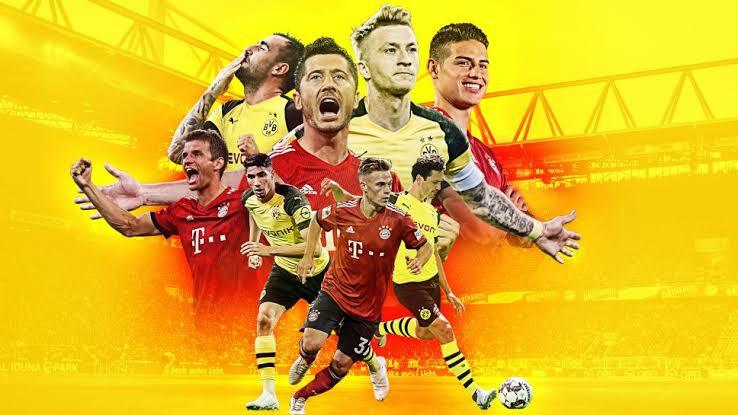 Stuttering eternal title favourites Bayern Munich on Saturday tackle leaders Borussia Dortmund at Signal Iduna Park in the champagne fixture of the 2018/19 Bundesliga season. Robert Kovac’s six-time defending champions are three points off Lucien Favre’s pacesetters courtesy of indifferent home form that has witnessed them fail to win any of their last four fixtures at the Alianz Arena. The Bavarian behemoths are however a different kettle of fish on the road where they are conquering all comers. Dortmund’s lead has on the other hand come courtesy of impregnable home form, with the yellow and black submarines averaging over three goals per game in front of their raucous fans. Dortmund were the last side other than Bayern Munich to win the German top flight competition, when under the tutelage of Jurgen Klopp, they won back to back titles in 2011 and 2012. It’s a point of frustration in Dortmund that Bayern cherry picked Robert Lewandowski and Mario Goetze who were the outstanding players of their side. Although Bayern Munich has in recent years dominated this duel, Favre will feel his mixture of youth and experience can upend the visitors’ preeminence. At 29, Marco Reus is the elder statesman of Dortmund’s attack whereas the century old Bavarian attack of Arjen Robben, Lewandowski and Frank Robert are in the evening of their careers. Elsewhere, Ralf Ragnick’s RB Leipzig welcome German football’s Jekyll and Hyde club Bayer Leverkusen in Sunday’s pick of the matches. Despite contrasting results on Thursday, both clubs are on course to reach the knock out rounds of the Europa League. Leverkusen were narrow 1-0 winners over FC Zurich but can expect a stronger examination from Liepzip who rested several first team players in falling 1-2 at Celtic. However, Bundesliga action gets underway on Friday night when Hannover, who are mired in the bottom three, clash with Bruno Labadia’s Wolfsburg. The visitors have lost their direction after briefly challenging for glory in September. Second placed Borussia Moenchengladbach meanwhile expect to exploit the possibility of leaders Dortmund dropping points when they travel to inconsistent Werder Bremen. In Sunday’s late kick off, free scoring Eintracht Frankfurt host last season’s deputy champions Schalke. Frankfurt’s much feared front three of Luka Jovic, Ante Rebic and Sebastian Haller are bound to fully stretch Domenico Todesco’s Schalke.